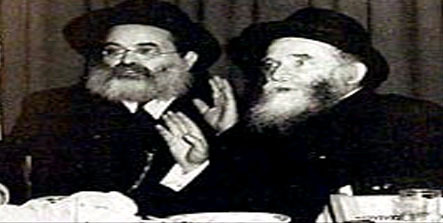 Rav Aharon Kotler was one of the very few Torah giants who contributed mightily to the transformation of the face of American Jewry in the middle of the twentieth century from one of Torah ignorance and mourning over the Holocaust to significant progress in Torah knowledge and partial recovery from the tragedy of the Holocaust. When he arrived in the United States in April of 1941, while the fire of Nazism was raging in Europe, he addressed an audience, "For myself, I wouldn't have come. I have come only to help save, with your assistance, American Yidden, the centuries-old Torah centers of Europe." He dedicated his life, night and day, to the building of Torah in America and by leadership of an organization called "Chinuch Atzmai," "Independent Torah Education," in Israel as well. Known in his youth as the "Svislovitzer Ilui," the Torah prodigy from Svislovitz, his fame had spread throughout the Torah world of Lithuania, and he had risen to become the head of the Yeshiva of Kletsk. He considered the Vilna Gaon, an eighteenth century Torah genius of exceptional greatness, one of his spiritual mentors. He saw in the case of the Gaon a genuine Divine revelation. He became the son-in-law of Rav Isser Zalman Meltzer, another great Talmid Chacham, and they had mutual respect to a high degree. He chose Lakewood, New Jersey, as the site for his new Yeshiva in America, because its location, far from the distractions of New York City, would enable his students to concentrate on their studies. The Yeshiva began very humbly; Rabbi Ezra Novick, one of the earliest students, reports that when he joined the Yeshiva, there were only three students. By the time Rav Aharon passed away, there were hundreds of talmidim, and they were beginning to have a major impact on Torah education in America. One of Rav Aharon's maxims was "One should imagine that his entire spiritual standing is literally dependent on how he utilizes the present moment, for the time that comes afterwards is a completely different entity." He wrote, "The great benefit that a Yeshiva brings to "Klal Yisrael," accrues to the entire nation, even to those who have distanced themselves from the Torah's ways. For the Torah and its scholars are the heart of the nation..."
Rav Aharon's efforts ultimately made a deep imprint upon American Jewry. Many thousands received a solid Torah education in or because of the Lakewood Yeshiva and its many branches during its first fifty years. The source of this biography is from the OU site: http://www.ou.org/about/judaism/rabbis/kotler.htm.